There is a saying in Italian: February is brief and bitter. Indeed, as one of the coldest and wettest months of the year, with choppy seas and winter gales, February may not be your first choice for a visit to Capri. That said, the days are already are a bit longer during this month, the mimosa trees are in full bloom, and when the un peeks out from behind the winter clouds, you can smell spring in the air. 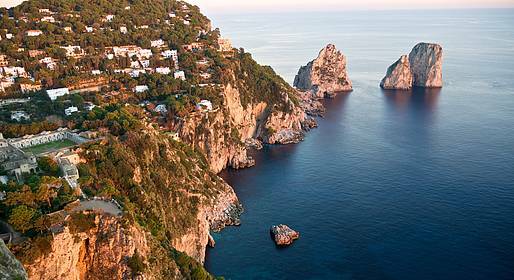 Islanders traditionally leave on holiday during this time of year, setting out for warmer climes to relax before the high season on Capri begins and it is difficult to get away. Not many hotels are open, but those that are offer unbeatable rates. On the 14th of February, instead of Saint Valentine, Sorrento celebrates Sant’Antonino, the town's patron saint. In the city center there is an open-air market and a statue of the saint is held aloft during the traditional procession. During the Carnival period, the streets are full of children in costume and outdoor festivities with parade floats and games are held. You can also sample le chiacchiere, a traditional fried sweet made only during this time of year. Choose from our selected and vetted tours & experiences. Book now for the best rates and availability! A luxury sail around Capri via a Fratelli Aprea lancia or gozzo boat, with welcome spumante toast and fresh fruit on board while we explore the island! A full 7-hour boat tour of the Amalfi Coast via private gozzo passing Positano, Amalfi, and Nerano before returning to Capri. A luxury speedboat tour from Capri to the Amalfi Coast for an unforgettable day at sea! Tour Capri by luxury yacht! The amazing ancient Roman resort town of Pompeii was buried under a mass of volcanic ash from Mt Vesuvius when the mountain erupted in AD 79. Today's walking tourreveals the city's remarkably preserved villas, theaters and baths. Living this experience as the ancient romains. Choose among our selected and reviewed accommodations on the island, with more than 12.000+ dream rooms reserved. A table with a view, dinner on a budget, an elegant gourmet meal...here is our guide to the best restaurants on Capri. Its delicacies such as "gnocchi di baccalà" and "pasta alla genovese"